O.MG! 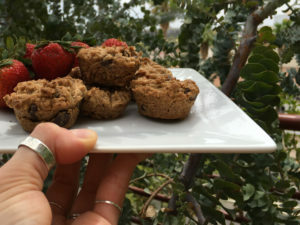 These are vegan, dairy-free, gluten-free and sinful! Besides, anything Mary likes is a double whammy win in my book! Just disregard how rich they are because, they taste like hey-I’m-just-gonna-have-one-more-or-two-or-what-the-heck-I’ll-have-a-third-one-thank-you-very-much! You want to double the amount you’re making, right now. Trust me on that one. Let the whole pan cool for at least 10 minutes before popping them out gently. I baked them in a mini-muffin silicone cups pan like this. This amount of batter filled 20 of the 24 cavities, at about 1 heaping TBSP of batter each. They’re about 135 calories a pop, but, yeah, whatever. As inspired by Angela Liddon on Oh She Glows. Next Post Of commitment, love and relationships.